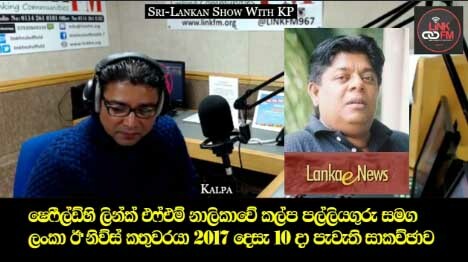 (Lanka-e-News - 14.Dec.2017, 11.45PM) A discussion was held between Lanka e news editor Sandaruwan Senadheera and Kalpa Palliyaguru of Sinhala broadcasting channel that is operating from Sheffield, Britain. The video footage of the discussion is at the end of this report. The editor who made a statement for the first time after the second ban imposed on Lanka e news revealed graphic details of how Lanka e news came into being ; who is the main accomplice in Ekneliyagoda murder ; why the source of information cannot be revealed; how common candidate Sirisena who should be a Butterfly metamorphosed into a Bat ; the background to the current LeN ban ; the future of Flower bud group , and many other issues. Happy to view this web.